Being a skeleton for Halloween isn’t anything new, but I’ve found people playing around with it a lot more. 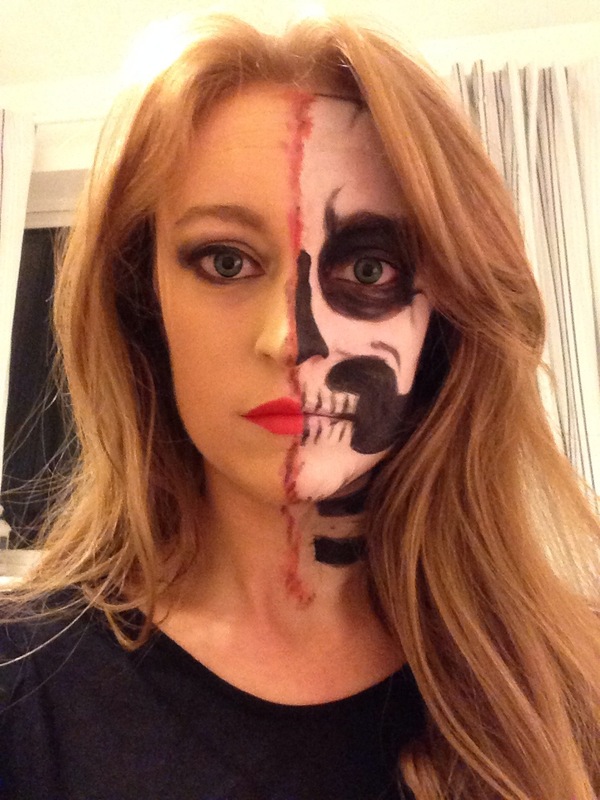 I went as a skeleton last year and decided to do the half skeleton face half normal face idea. It’s a lot less stressful because you don’t have to worry about making the two sides of your face even, or matching. There’s a couple of different ways you can dress up too. You can either do the whole Lady Gaga in a tux look, or a skeleton costume, or you can leave the make up to be the focal point and wear all black. It’s up to you! Click the pictures below to shop the looks! When it comes to skeleton make up, the most important thing is to give yourself enough time. I gave myself an hour and a half to do my skeleton make up. It ended up being too much time, but it’s better to do that than to rush yourself. It’s important to put on your tops first because you could wreck your make up buy putting on a top afterwards. I started by doing my normal side of my face first, except for lipstick. Once that was done, I put two layers of white face paint over the other side of my face. I filled in all the dark shapes with black face paint first – the nose, the eye, the cheekbone and the neck. I then added the cracks and shading with a smaller brush. Don’t forget to go along the hairline, and add little lines here and there. I finished up with adding the teeth section. Once that was done, I used red lipstick on a brush to blur the divide between my normal face and skeleton face. I dabbed a little dark eyeshadow over this to give it some depth and then added some red lipstick to the normal side of my face to finish it off. So there you have a skeleton face! It’s not that hard, you just need to take your time. Check out my other Halloween inspiration posts – Audrey Hepburn, Vampire, Leopard and Greek Goddess – if Skeleton isn’t your thing!